Sophomore guard Terry Nolan Jr. makes his way past a Towson player during a game in December. When: Sunday, Jan. 6 at 2 p.m.
Atlantic 10 season is upon men’s basketball (4–9) as the Colonials travel to Philadelphia to take on Saint Joseph’s (7–6, 0–1 A-10) in GW’s first conference matchup. The Hawks lost to A-10 opponent George Mason Thursday, 85–60, after allowing the Patriots to embark on a 19–0 run in the final minutes of the frame. On the other hand, the Colonials are coming off a gritty overtime win over American to close out their nonconference schedule. The last time the two teams met, GW captured a 70–64 win over the Hawks to open last year’s A-10 action. Sophomore forward Javier Langarica put up career-high numbers against the Eagles with 15 points and 12 rebounds. Four Colonials scored double-digits against American – a deeper offensive attack that they will look to maintain against conference opponents. Saint Joseph’s overall averages 73.2 points per game, but concedes 72.7 points to opponents. If the Colonials can spark their offense, continue to spread the wealth on the court and get multiple players good looks, they should be able to keep the game close Sunday. 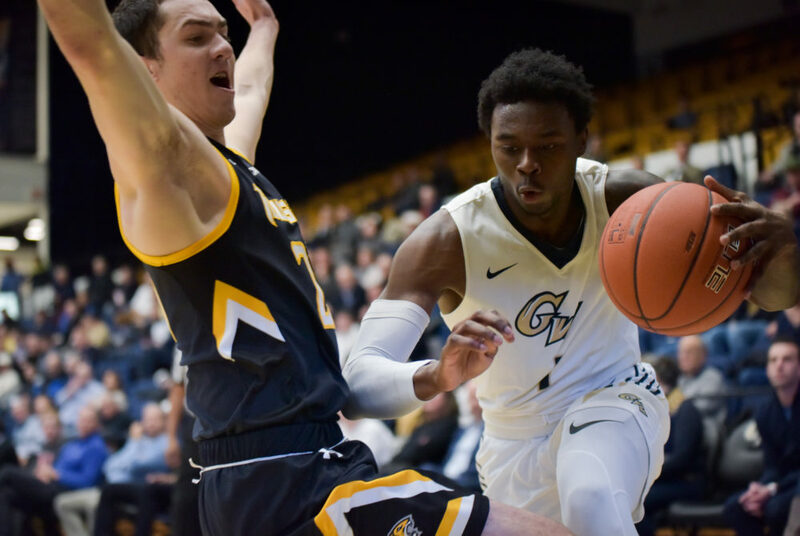 GW has been able to limit teams’ top-scorers to below-average numbers in past games, but it will be challenged against Saint Joseph’s redshirt sophomore forward Charlie Brown Jr. – who leads the conference averaging 20.3 points per game. If the Colonials can take away the long shot from Brown and force him to pass the ball, it will go a long way in helping GW shoulder the Hawks’ scoring load. The Hawks are more lenient defending the three-point line than the last three opponents GW has faced off against, allowing opponents to shoot 37.9 percent from beyond the arc. Sophomore guards Maceo Jack and Terry Nolan Jr., GW’s top-two sharp shooters, should look to take advantage of the space along the perimeter and take high-volume shots for the Colonials. The Colonials will need to be able to get as many looks at the basket as they can against Saint Joseph’s. The Hawks rank fourth in the country with fewest total fouls committed and limit opponents to 10.9 made free throws per game. Redshirt junior guard DJ Williams leads GW with 5.4 boards per game. But last time out, against American, five Colonials grabbed five or more rebounds in the game. Both the Hawks and the Colonials are outrebounded by their opponents on the season, and while Saint Joseph’s averages 34.5 rebounds per match, the Colonials are not far behind with 33.2 rebounds per game. Slowing down the Hawks’ play on offense will benefit the Colonials, but they will be hard-pressed to force the Hawks to give up the ball. Saint Joseph’s ranks second in the nation with just 9.2 turnovers per match. If the Colonials crash the glass like they did against American, GW could earn crucial extra looks and possessions against the Hawks. The Hawks boast the A-10’s leading scorer in Brown and will most likely be feeding him the ball Sunday. Brown is deadly from beyond the arc, but is not the only Hawk who can score. A total of four players on Saint Joseph’s squad are averaging double-digit scoring and it will be difficult for GW to limit all of the Hawks’ shooters. The Colonials allow opponents to shoot 44.2 percent from the field and 37.7 percent from the three-point line, numbers which favor the Hawks’ high-scoring offense. GW has struggled in past games against teams that get hot from the perimeter, and if the Hawks get the ball in Brown’s hand deep, it could be a long afternoon for the Colonials. The Hawks have sticky fingers and rarely turn over the ball. The Colonials force opponents to give up the ball 13.5 times per game, but give up the ball themselves at nearly the same pace. If Saint Joseph’s moves the ball on offense and disrupts the Colonials’ defense, the Hawks should be able to hold onto the ball longer than GW and capitalize on more possessions. Despite both sides putting up similar numbers under the glass, Saint Joseph’s holds a slight height advantage over the Colonials in the frontcourt. Langarica – who has started the last five games for the Colonials, is the tallest starter on the floor for GW at 6 feet 9 inches tall, and Williams is the next tallest at 6 feet 7 inches. Hawks sophomore forwards Anthony Longpré and Taylor Funk clock in at 6 feet 10 inches and 6 feet 9 inches tall, respectively. The pair should be able to get some good looks under the rim against the Colonials if the opportunity presents itself. Sunday’s game looks to be a defensive endeavor for GW. The Hawks allow opponents to produce nearly as many points as them on the court, but the Colonials have been averaging 9.2 points less than Saint Joseph’s on the season. If the Colonials can get going from the three-point line and outplay the Hawks under the rim, GW might be able to reconcile with the Hawks’ deep offensive production and keep the game competitive. It will be a tall order for the Colonials to contain all four of Saint Joseph’s scorers, but if the Colonials show up like they did against American, Sunday’s contest looks to be a tight one.